Holos Skincare, created by Holistic Therapist Niamh Hogan, gained media attention from the beginning. Holos moves fast and every month you’ll find something new about the brand’s journey, product development, company news or awards. The very first Holos appearance in printed media was in the Irish Independent on the 14th of June 2014. 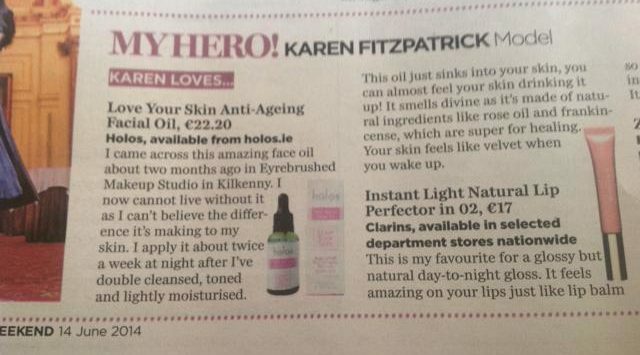 Just 5 months after launching Holos Skincare, Niamh was very excited to learn the well-known Assets model Karen Fitzpatrick recommended Love Your Skin Facial Oil saying she could not live without it. Niamh is not sentimental, (she says she hasn’t time to be) so she did not frame it, not to mention even keep the newspaper as important memorabilia. She did however take a photo so it will live forever on the inter-webs and she is very very proud of this piece. It lead to Holos; first big wave of website visitors. Niamh will always be very grateful to Karen for this piece. Holos cooperates with many bloggers in Ireland and the UK. They willingly try Holos products and share their experience and opinions. Niamh may not be sentimental but she remembers people. Below is the first blogger’s review written by Mary O’Donnell from Tralee on the 15th of May 2015. 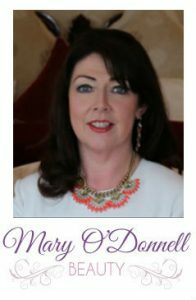 Mary has remained an avid supporter of Holos since and can be seen recommending it on RTE’s Today Show from time to time. Niamh was talking to Lisa Cannon about her experience as aromatherapist and holistic approach to products. Browse our blogger reviews, magazine, newspaper and TV coverage to get some more of Holos.